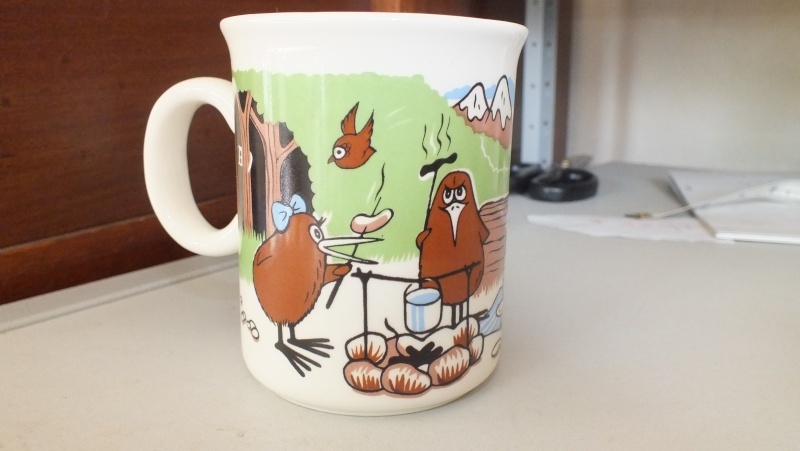 We have a Crossfords Kiwi Family New Zealand pattern in the Crown Lynn Gallery, which came from Manos. 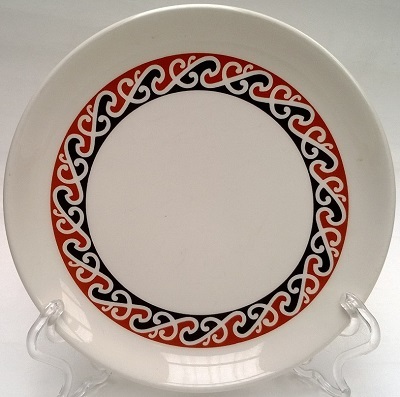 Today I found a Crossfords Koru Design New Zealand side plate the same as this auction .. I just need confirmation that it was made by Crown Lynn please, as the plate shape didn't feel familiar. I know the story about the Kiwi Family design as I follow the Viking on Facebook and he said that Bettina his lovely wife did the artwork for Crossfords. I won't get to put up a photo until Sunday. When we went to the Vikings shop in Woodville at the beginning of the year he told me all about his wife doing the artwork for the Crossfords too. It was very interesting. 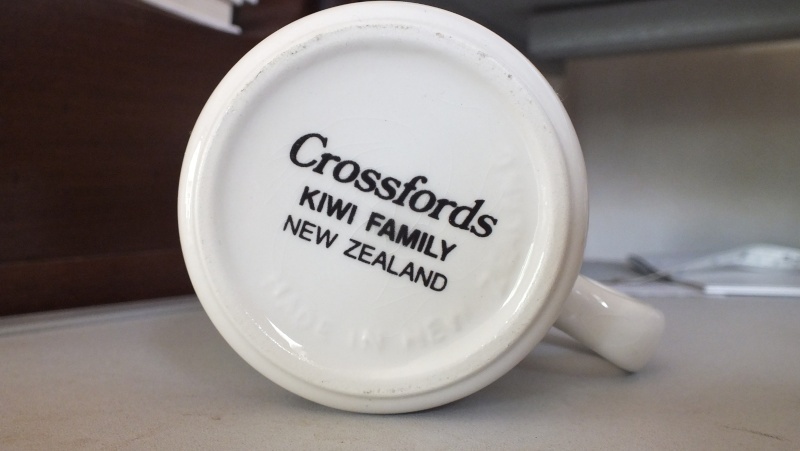 There were four of these Crossfords Koru Design New Zealand side plates and three were terribly crazed. This one however is perfect and 'feels' like Crown Lynn. It is 177mm across and has a deeper shape that any other Crown Lynn side plate that I can find. The backstamp has a Crown Lynn look about it too. Darn I wish I had kept a copy of that auction above to compare the cup shape, but now it's gone, though hopefully it will come back. I am confident that the Crossfords kiwi dessert plate is CL. I did a bog post on this after talking to Bettina about her role. We can ask her about the koru ware. When i get home from weekend away. Has "Made in New Zealand" in the mould. Ev wrote: Darn I wish I had kept a copy of that auction above to compare the cup shape, but now it's gone, though hopefully it will come back. Thanks as now I can see that it's a shape 3061 first made in 1982. This 1397 stein was made for Crossfords. It is the same shape as the limited edition Tom Clark one. The only marks on the bases of both are the transfers. 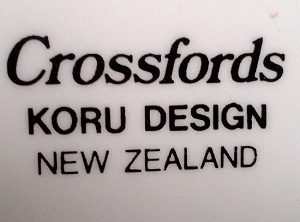 I have posted this Crossfords mark in the backstamps gallery, and as the other shapes have been confirmed as CL I have also posted the Crossfords Kiwi Family New Zealand and Crossfords Koru Design New Zealand. The cup is classique shape. Yes I worked that out, but I can't work out why these are not in the records anywhere. Did another company buy the blanks and put their own artwork on them? I doubt it, but I still want to know. 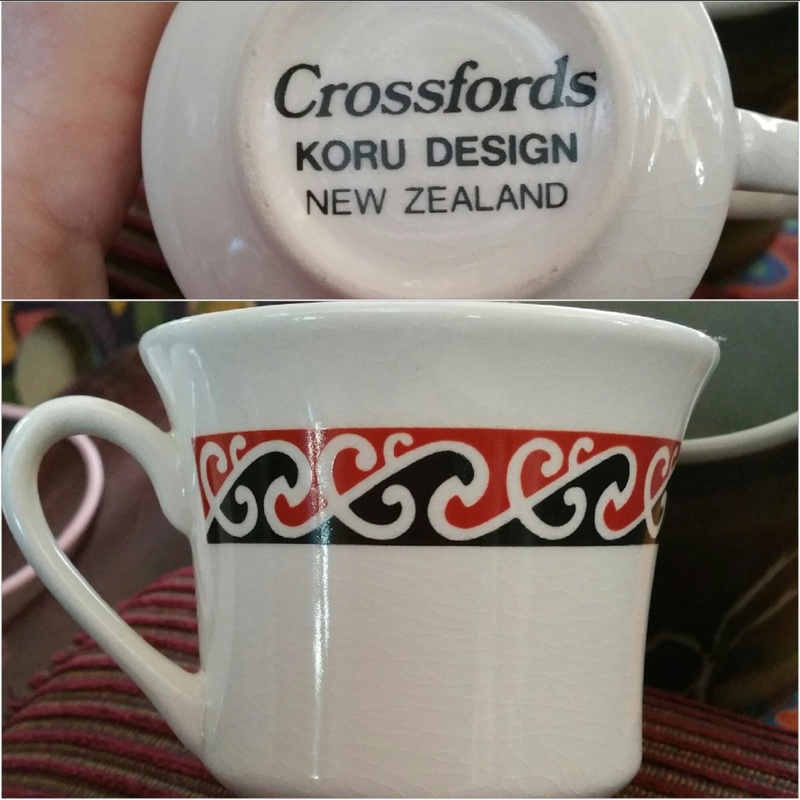 I have this big ole mug, backstamped ’Crossfords’ and has a very retro looking Auckland Harbour Bridge scene. I’m pretty certain it’s Crown Lynn given it’s the same shape as so many other Crown Lynn Mugs. Well the shape is 1487 and was first made in the later 1980's. Crossfords had a connection with Crown Lynn at this time, though we still don't know the full story. It's the glaze that I'm having trouble with however, as all I can see is the Orzel speckled glaze with that contrasting band of brown at the top. Jeremy needs to take a look. It looks remarkably similar to the 1397 I posted above. 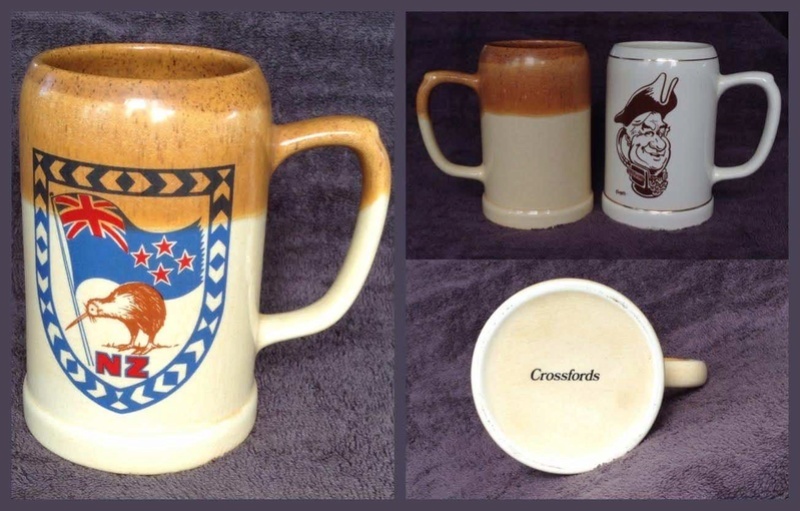 I do have some Orzel tankards made in one of the CL shapes but do not see a connection to the Crossfords. The glaze on this one is same as mine and it never occurred to me that mine had an Orzel connection. I could be wrong but I think the 1397 was also used for Ford Sierra. That would make just three patterns in this shape that I know, Tom Clark, Sierra, and now two Crossfords if Ducks Nuts' one is 1397 rather than 1487. 145mm high x 98mm wide on the base. Made from 1983 to 1986 and 165 were made. Do you remember how many of the Tom Clark ones there were, Ev? Clearly a limited edition if total of Clark and others was just 165. 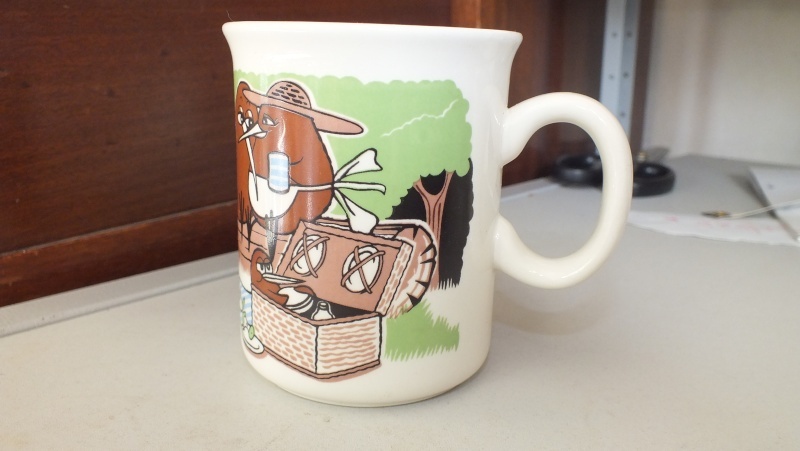 There were 160 of the Tom Clark retirement mugs made, so there must be some more production records to find I feel.